I still believe that my 8th great-grandmother, the wife of Samuel Nicholson and the mother of my ancestor Abigail Nicholson, was Elizabeth Kent, born 1 Jun 1667, the daughter of Thomas and Ann Kent, and also the widow of William Charles. Most researchers agree that Elizabeth Kent, daughter of Thomas and Ann, did marry William Charles on 8 Nov 1683. She would have been 16 years old. William and Elizabeth had a daughter Jane born 1 Oct 1685. Then William died between 4 Apr 1687 when he made his will and 23 Sep 1687 when the will was probated. William named his wife "Elezabath Charles" and his daughter Jane Charles in his will as well as his brother John and other legacies. Then the question is, who did the widow Elizabeth Charles marry? I believe it was the Quaker Samuel Nicholson who did marry an Elizabeth Charles 6, 10m, 16[88?] as recorded in Gwen Boyer Bjorkman's book of Quaker Marriage Certificates in northeastern North Carolina (pg 85). In Weynette Parks Haun book of transcriptions of Perquimans Precinct Births, Marriages, Deaths and Flesh Marks 1659-1820 she lists their marriage 16 Dec 1688. Since this was the time for the old style calendar, December was the 10th month. One of the reasons why I believe this was Elizabeth Kent was that 2 of the witnesses for that marriage were Mary Kent and Hannah Kent, the only mention of any Kents in Bjorkman's book. So, if this Elizabeth is my ancestor, who were her children? The Perquimans birth records show that Samuel and his wife Elizabeth had at least 4 daughters: Abigail, Hannah, Jane and Elizabeth. There were probably a few more. This may indicate that Elizabeth's daughter, Jane Charles, had died before this Jane was born in 1694. I haven't been able to find any further records for the Jane Charles born in 1685. Elizabeth became a widow again when Samuel died 28 Mar 1728. He had made his will a few days before he died and gave to his wife "Elizabarth" "my whole estate during her life." It was then to go to his daughter Elizabeth Anderson. He also gave a bequest to his daughter, Sarah Nicholson. Apparently Elizabeth then married for a 3rd time to widower Zachariah Nixon. And again she became a widow when he died in 1739. Elizabeth left a will, dated 19 Mar 1747/48 and probated January Court 1748. 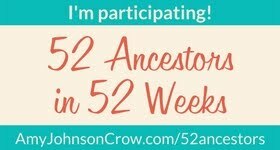 (This should probably be 1748/49) She named her son-in-law John Anderson and daughters Elizabeth Anderson and Sarah Jones, as well as grandchildren and others. Elizabeth has been difficult to research and I am certainly not 100% sure that I am correct about which Elizabeth is my ancestor. But at the moment this is my belief about her.